The Aliante Iperspazio are medium sized (44H x 23W x 29D, in cm.) bookshelves entirely designed and crafted in Italy. It is a mostly classical design: it has a 17 cm woofer and a 26 mm tweeter, two reflex ports in the front baffle, double binding posts for biwiring and a classical *Italian* walnut finish (see picture to have an idea on how gorgeous the Iperspazio is). List price in Italy is slightly more than 1000 $. For more technical infos (crossover components etc.) on the Iperspazio's you're warmly invited to take a look at the tech specs. These loudspeakers are very natural and *neutral* in the sense that not a single part of the musical spectrum prevails over the rest. The Iperspazio are made to reproduce Music and not HiFi. The tweeter does an excellent job, sounding very precise, detailed and *clean* though it never gives the idea of a razor-sharp reproduction. I call this *natural precision*. You can be sure that if there is a detail these speakers will reveal it to you, such as, for example the *hiss* of the air passing into the pipes of a big church organ or the breath of a big choir. This performance is aided by a very natural and clean mid-range which gives to the female voices a grace and a sensuality that are simply amazing. Male voices lack some *weight* instead and I'd have preferred a more presence of the mid-bass notes. Even for this reason, and for the peculiar dynamic behaviour (see below), the big choirs sometimes do not *come out* big as they should be but this is the price to pay for a very *civil* representation of the musical program: never too *shouted* nor aggressive. A touch of class, indeed. With some software or certain amplifiers the end result could become overbright, especially if we try to force the natural precision of these speakers with wrong cables and stands (see below). And what about the bass range? It is very deep and smooth though not exactly *punchy* but remember that these speakers have been designed for Music reproduction, not to shake your underwear with Jurassic Park bass-booms. You can still hear the lower notes but just with your ears not with your body, if you know what I mean. As I said before, these speakers aren't exactly meant to *impress*: they are vivid but not outstandingly fast, they can sound loud if required but they don't like to shout, period. They can *rock* if necessary: I've tested these speakers with anything available into my records collection: from organ works to rap and even some heavy metal tracks. It is very difficult to make them sound nasty: even with heavy metal they're clean and precise and you can easily follow each electric guitar chord and effect. The drums of the famous Sheffield drum record are fast but not exactly earth-shaking as they should be. Despite of this the drum kit materializes into your listening room, less explosive than with good floorstanders but yet very, very natural. At this price it is hard to find a loudspeaker that gives you impact, punch, explosive dynamics combined with natural and precise tonal reproduction. It's always a *give'n'take* game. If the Iperspazios sound very natural and with a good sense of rhythm their *forte* is the 3D soundstage: not exactly huge but so precise and deep that you wouldn't believe to your eyes...these loudspeakers simply disappear, even with mediocre recordings. It is hard to hear the sound coming out from the speakers since it seems the source is well behind them. And not only behind but also aside and above. With the right recordings the heigth of the soundstage is well above the ceiling of my listening room so that I can SEE the organ of the Proprius's Cantate Domino in front of me, several meters behind the loudspeakers and a couple of meters above them. If there is a secret for this outstanding performance it should be asked directly to Giuseppe Prato, the real wizard of these speakers. I can just try to give some explainations for worth are they worth. First of all the quality of the speakers, of the passive components into the crossover and even of the Monster Cable wires that have been used to connect the crossover to the speakers. Then we should take a look at the cabinet: the tweeter is mounted *aligned* with the baffle while the woofer slightly *protrudes* outside. In other words and thanks to the slightly downwards-sloping baffle these loudspeakers try to minimize the *phase error* between the woofer and the tweeter so that their emissions are *time coherent*. Now, for what I know, nobody has proved that *time-aligned* speakers do deliver a better stereo image but clearly Giuseppe Prato thinks this affects soundstanging to some extent. Also, the transition between the woofer and the tweeter is a *continuum* and this helps to maximize the *point source* effect, still improving the soundstaging. The cabinet is very solid and free from inner resonancies, another issue that should be kept in mind when designing a loudspeaker that should deliver a realistic 3D soundstage. If you sum up all these aspects of the design of the Iperspazio you'll start to understand why these speakers are so good at soundstaging. Of course, to achieve the excellent results these speakers are capable of, you should place them far from the near walls (rear and lateral) and also *toe-in* them a little. Just be sure that the ideal axes of the speakers intersect slightly in front of your nose. First of all forget to use your cable forks with the Iperspazio binding posts: the connectors are so near that locking them onto the forks is almost impossible. The same should happen with bare wire too. Bananas are not a problem, though. I'm here to publicly ask to Giuseppe Prato to use wider spaced connectors, so that even human hands :-) can lock and unlock them easily. Biwiring is a *must* since imaging and precision improves a little bit more. As for stands: the Iperspazio seems to prefer light and stiff ones, like those crafted in aluminium by Aliante itself. Stand height between 55 and 65 cm, depending on the height of your *listening chair*. I'd advice to not exaggerate with tip toes or spikes because in this case one can easily get *too much of a good thing*: it's better to use graphite blocks, cork feets or FoculPods: you lose some detail but you gain some *weight* in the mid-bass range. Another touch of *class* are the 8 small plastic stickers with the Aliante logo, meant to be glued below the speakers just to avoid that the spikes of the stands could damage the precious cabinet. Some break-in is necessary: Aliante recommends at least 30 hours, I'd say 40 or even more: after the break-in period the speakers have better, deeper lows, cleaner and sweeeter highs and deliver a wider soundstage too, not to mention overall dynamics. The recommended amplifiers are those with a warm and sweet note: avoid everything too bright and *razor-sharp* if you don't want experience -again- *too much of a good thing*. 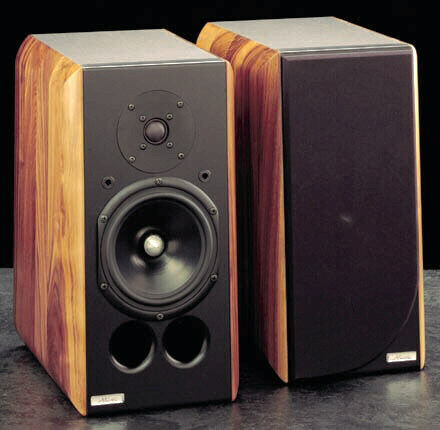 A final note on the list price: the 1000/1100 $ required (in Italy, your mileage may vary) for a pair of Iperspazio is widely justified by the overall quality of these speakers. Just think at the quality of the components, at the gorgeous real walnut finish, at the passive components and the Monster Cable internal wiring, at the little accessoires mentioned before and, finally, at the elegant and classy sound of these babies. Despite of this I still dream of a Iperspazio with a cheaper finish offered at a still lower and competitive price. The Aliante Iperspazio is for the mature audiophile, for who is capable to understand the qualities of this speaker, since these qualities need some time to be recognized and entirely understood. Letting the 3D imaging aside, which is amazing since the first minute, the rest of the personality of these speakers requires some time to be fully unveiled to our senses, exactly like the best things in life. If you're looking for a classy, precise, detailed bookshelf, with a good bass extension and a simply amazing soundstage please consider to *rent* these speakers for a long and relaxed listening into your room with your system. Then relax and listen to the Music, not to the speakers. To me, one of the best qualities of any HiFi component is just this: playing Music without being too *visible* (in the sense of *I'm here!! !You're listening to me! *), like it should happen in everyday's life.